Alternate Names: "PDC World Championship Darts 2008", "PDC World Championship Darts 2009", "PDC World Championship Darts 2008 DS", "PDC World Championship Darts 2009 DS", "PDC Darts", "PDC Darts 2008", "PDC Darts 2009", "PDC Darts 2008 DS", "PDC Darts 2009 DS"
STEP UP TO THE OCHE AND GO HEAD-TO-HEAD AGAINST YOUR FRIENDS OR THE GREATEST CHAMPIONS OF THE PDC. Easy to use throwing method, addictive gameplay and natural dart flight using the Nintendo DS stylus! 16 PDC pros to play as and compete against in real-world tournament locations, with commentary from Sid Waddell and referee audio from Bruce Spendley. In-depth career mode, cully customisable tournaments and leagues, and party games! 2-8 player multiplayer tournaments and leagues. 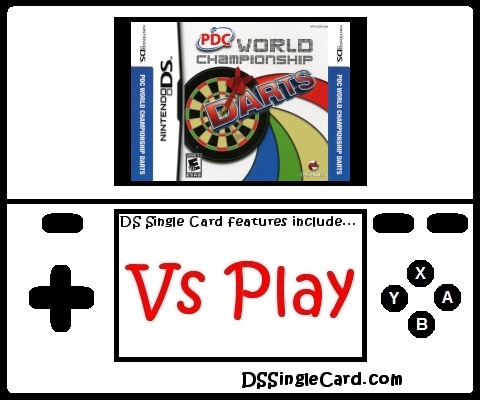 Play against a fellow Nintendo DS owner via DS Wireless Communications (Single-Card Play). 3 levels of difficulty so beginners and hardened darts players can all play together!